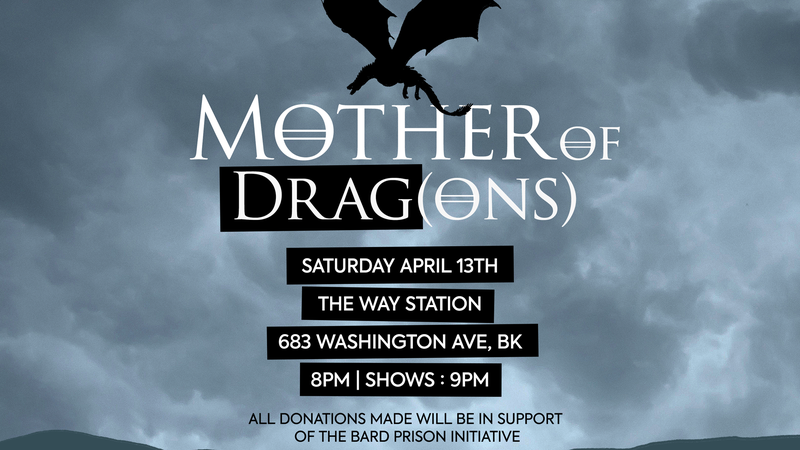 io9 is proud to be hosting “Mother of Drag(ons),” a free drag show dedicated to that fantasy series we all know and love—this Saturday, April 13, at the Way Station in Brooklyn, New York. We’ll be featuring drag performances by Tyler Ashley, Patti Spliff, West Dakota, and others, and the Way Station is opening up an official Game of Thrones keg of beer to mark the occasion. We’ll be collecting donations at the event in support of the Bard Prison Initiative, a college-in-prison program dedicated to offering classes and degree opportunities for people who are incarcerated. The event itself is free and open to the public. Let us know if you’ll be attending by adding your name to the RSVP list here (does not guarantee admission). Doors open at 8 p.m., and the show starts at 9 p.m. We’ll see you then...for the night is dark and full of terrors. And amazing drag queens.